Hey Honey, It's a Cat's Pajamas Sneak Peek! Well, I'm so excited to finally be able to show you a card I did for the new release coming on February 27th for The Cat's Pajamas! There will be 3 new stamp sets and have no fear, Sprinkle and Poochie and the Penguins are well represented, but I also fell in love with this little image from another set called Hearts & Flowers. This is my first release for Alma since becoming a true member of the Cat Pack at the first of January. I went with the "less is more" feel for this card and really love the result (maybe I should try it more often?). As I was thumbing through a Papercrafts Magazine, I came across a similar layout as this and couldn't wait to try it. I don't think I've ever done anything on a diagonal like this! It was a little tricky cutting it, but after a couple of tries I got it right. 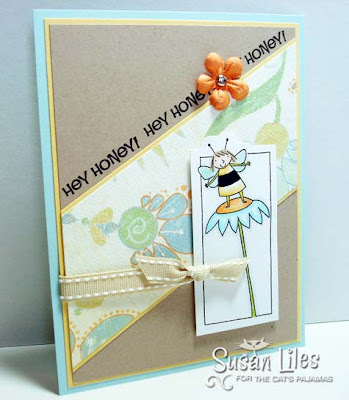 I'm loving this Baby Bee paper from Crate Paper that Alma sent us as well--the texture of it is so yummy! The little "bee girl" and her flower are colored with Prismacolor Pencils and blended with a little odorless mineral spirits (what I often refer to as OMS, but just in case you ever wondered what the heck I meant by that, I thought I'd spell it out this time!). I even painted a little Shimmerz on her wings! I'm not too sure my hubby, Eric, would like this card. Any time he hears "Hey Honey", he tends to have selective hearing and pretends he didn't because it usually means I'd like him to do something for me (aka a chore or laundry)! Anyway, stay tuned, there's more where this came from! SUSIE Q-TIP: Repeat a sentiment in a straight line across your project as a fun little unexpected element. This is such an adorable card! I love the layout especially. The colors are soft and springy. What a adorable card Susie!! Love it! S-U-C-H adorable sweetness, Susan! Totally YOU!!! Adorable! Love the soft colors and the fab-o diagonal layout.